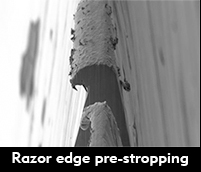 Stropping– the process of “aligning” the extremely fine cutting edge of a straight razor before and after shaving. Since human facial hair is about as tough as copper wire of the same diameter, the cutting edge can be “sharp” but not comfortable to use. Stropping is similar to running a kitchen knife along the steel in your knife block before usage. This is how a blade is maintained. English Bridle leather comes from cowhide and has gained much popularity in the razor community lately. The tanning process involves pure vegetable tanning ingredients which yields a very firm and smooth leather. 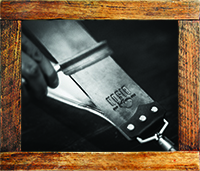 The grain pattern on English Bridle is broad and large so selecting flat sections to cut strops out of is crucial. 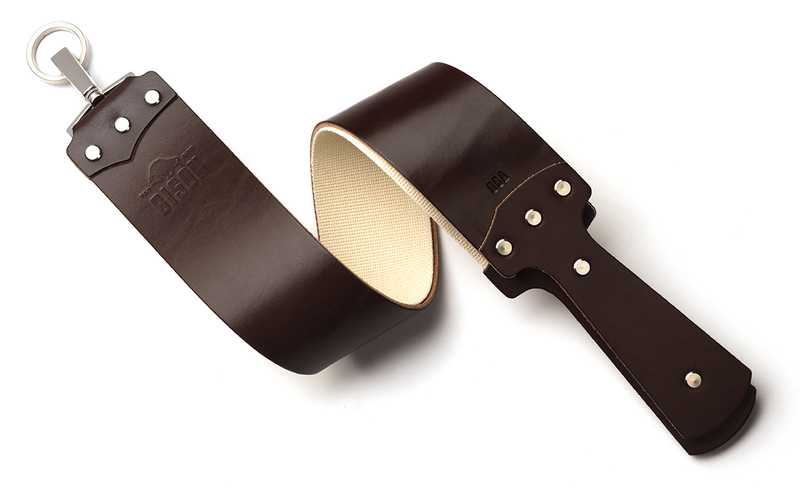 When used in Strops, English Bridle provides a fair amount of draw- valuable feedback when perfecting your stropping technique. Care for with a cotton cloth and neatsfoot oil semi-annually. Natural Horsehide comes from the sides of horses and has been the stropping material of choice for over 100 years. It is vegetable tanned and lightly tumbled, yielding a soft and supple feelwithout a waxy texture. The grain pattern of Horsehide is smaller than Latigo, however selecting pieces that are flat and without blemishes is very important. 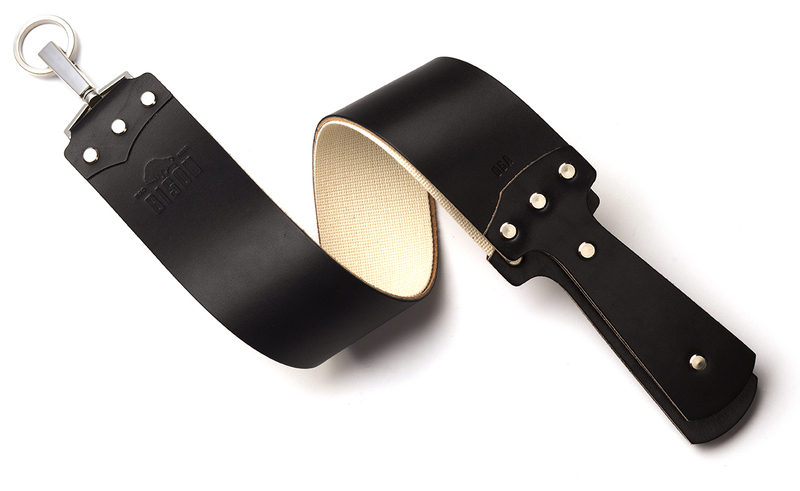 When used in strops, Horsehide will provide a medium amount of draw and expertly maintain the cutting edge of a straight razor. Some of the best care comes from simply rubbing the leather with your hands or fingers- your natural oils are perfect for this leather. Buff with a cotton cloth as needed. Genuine Cordovan Shell is a membrane found under the skin of a horse’s rear. This material is very expensive because only a small amount comes from 1 hide and the tanning processes takes several months. The grain pattern of Cordovan is very tight and the leather is extremely flat and pliable. 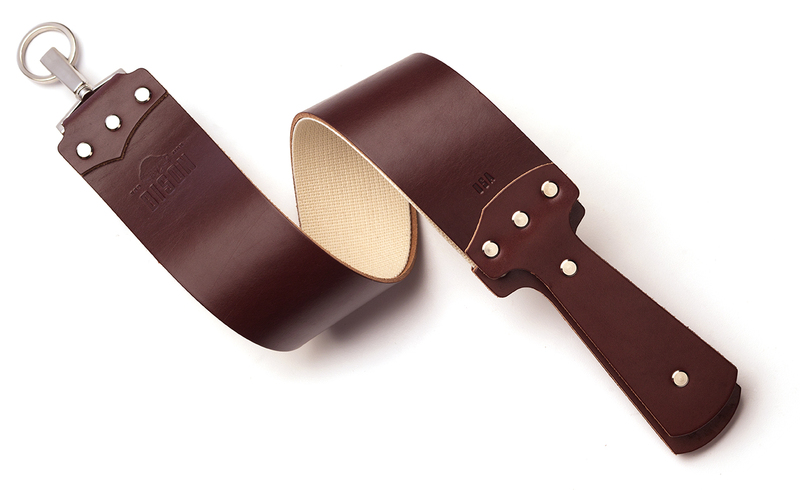 When used in strops, cordovan provides the perfect draw and flexibility making it the superior material to be used. Cordovan can be polished with fat-based products designed specifically for the material. Buff with a cotton cloth as needed. Draw – the resistance of the leather against the steel of a straight blade. It is the feedback one feels when using a strop and is very much a personal preference whether more or less is desired. It is akin to the way a car “grips” the road. Lap– One pass of a straight razor blade back and forth along a medium. Honing– the process of uniformly removing metal from a straight razor blade to bring both sides together as close as possible. Honing is carried out with a series of natural or synthetic sharpening stones. This is how a blade is sharpened and should be done every 3-6 months or as the shaver requires to maintain comfort and performance. Neatsfoot Oil – a great conditioner for leather products like baseball gloves and strops. Neatsfoot oil will keep leather soft and supple, prevent drying or cracking but also increases draw. 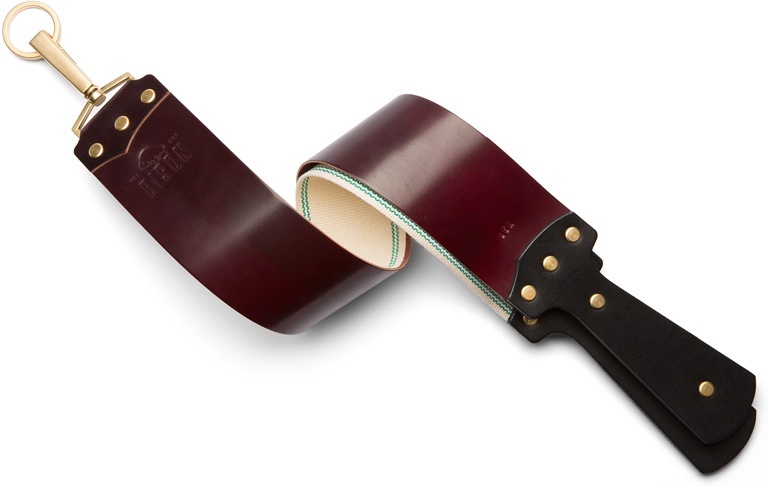 Pastes – compounds added to either the canvas or leather side of a strop that increase its ability to maintain or sharpen the cutting edge of a straight razor. Some pastes can even take the place of regular honing on a sharpening stone.